We can’t bear to lose medicare. 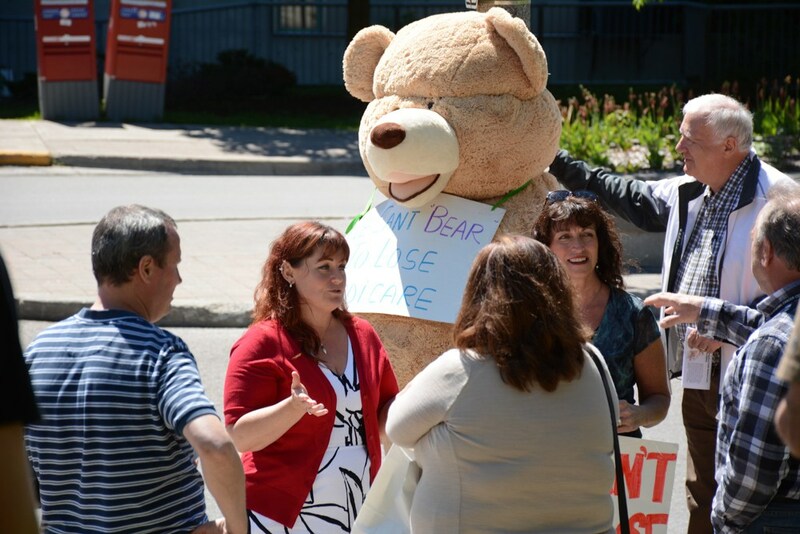 That slogan adorned the placard tied around the neck of a seven-foot tall teddy bear that arrived at Lakeridge Health Oshawa, as the Ontario Health Coalition (OHC) continues to spread its messaging about the threat of health care privatization. The OHC’s education campaign is geared at informing Ontarians about how privatization has “crept in” to the provincial system where private clinics are charging “user fees” amounting to hundreds or sometimes thousands of dollars for certain procedures, a practice that threatens everyone’s access to “universal” health care under the Canada Health Act, the coalition says. However, the argument exists that these private systems can actually improve Canada’s system by allowing Canadians another option for their care and potentially reducing wait times at local hospitals. The OHC states that these “profit-seeking” clinics are maximizing their profits by charging the government under OHIP, while also collecting an assortment of fees from patients, a practice that impacts seniors the most, McAuliffe says. The giant bear also has a second goal of raising funds for the B.C. Health Coalition who are currently in the midst of a legal challenge brought on by private clinics, a case that has made its way to the province’s Supreme Court. That case is centred around Dr. Brian Day’s Cambie Surgery Centre, which charges patients for services. The court is currently looking to determine whether to allow private insurers in the province to pay for services available under the public system and whether doctors can charge privately for services. “If Brian Day wins that argument all bets are off,” says Sara Labelle, with the OHC and medical laboratory technologist with Lakeridge Health. For Labelle, the emergence of this “two-tier” healthcare system not only impacts patients needing services, but can also pull talented professionals out of the public sector, lured away by increased pay and steady hours in private clinics. From Oshawa, the giant bear has made its way west to several locations including Kitchener, Stratford and Woodstock before its final stop of the tour today (June 14) in Thunder Bay.